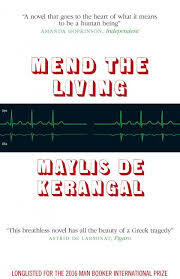 Mend the Living by Maylis de Kerangal is what you might call a concept novel, a novel where the central idea is likely to be better known than the author or title (perhaps that’s why in the US a different translator has opted for The Heart). It’s easy to imagine curious readers asking for ‘that book about the heart transplant’, and it was that same curiosity that first prompted my desire to read it even before it appeared on the Man Booker International Prize long list. Its story is, on one level, simple: a young man, Simon Limbeau, dies in a traffic accident, and his heart is taken from his body to replace the ailing organ of a middle-aged woman, Claire Mejan. What makes this novel stand out, however, is not just the emotional power and originality of its concept, but the richness of its telling. Gone is the certainty (“must have”), and we see echoes of modernism in the interjection of Marianne’s thoughts into the sentence. In fitting with the novel’s exploration of what we mean by life, the narrative voice exists in tension between the outer, objective and the inner, emotional. For the latter effect, Kerangal is not afraid to use long sentences (the quotation above is extracted from one containing more than 180 words). This creates a rhythm which pulses through the novel making the text itself seem alive in a novel where the irrepressible nature of life is a main theme. It seems appropriate in a novel about life that every page, every moment should seem so alive. A great deal of credit for this should go to the translator, Jessica Moore – and it’s worth recalling that the Man Booker International Prize is also for translation. Any fear that the novel might be a gimmick is dispelled by the wonder of the writing. I fully expect to see Mend the Living on the short list. This entry was posted on March 24, 2016 at 7:41 pm and is filed under Man Booker International Prize 2016, Maylis de Kerangal. You can follow any responses to this entry through the RSS 2.0 feed. You can leave a response, or trackback from your own site. How timely. I’ve just been catching up with a few podcasts (my usual accompaniment to a walk in the park), one of which included an interview with de Kerangal. It’s a really interesting subject to explore through fiction. Glad to hear you liked this one. Yes, I think it has a strong chance of being on the short list. Thanks for the link – it’ll be interesting to hear what she has to say about the book. I read and reviewed the US version called The Heart. Great book. I learned so much about the entire process. One of my favorite characters was Thomas, the nurse. He was so compassionate and great at his job. Yes, it’s the strength of the many characters which make the book so interesting. I loved Cordelia, the nurse, immersed in her own drama! I see the US version has a different translator – I wonder if that made a difference to our reading experience as it’s a novel where style is also important. Really enjoyed this one too when I read it last month. The writing/translation is a joy to read and I agree that this should be a strong contender for the shortlist. I hope so – I liked the idea behind it, but also the structure and voice.